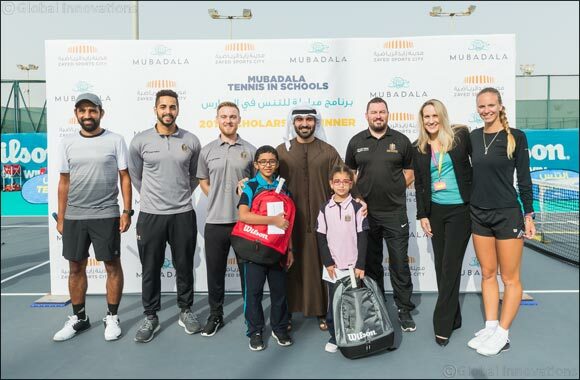 Abu Dhabi, 7 February 2019: Zayed Sports City, in partnership with Mubadala and Ministry of Education, has awarded a Zayed Sports City Tennis Academy scholarship to two students from the 2017/2018 Mubadala Tennis in Schools program. The scholarships were awarded as an appreciation to the students' natural ability and skill set for tennis, combined with a want to learn and enjoyment shown throughout the school sessions. The Mubadala Tennis in Schools program is one such initiative that aims to grow the game of tennis in Abu Dhabi. Created to ensure a legacy for the sporting youth, the program brings tennis to over 14 schools and 200 students each season. The program has been developed with a 360-degree approach that's invests both in the teachers and the students, with the overall aim of growing tennis from a grass-roots level and making tennis more accessible in and out of school. This year, the program welcomed 622 students and 138 teachers were trained with a total of 154 accumulated teaching hours. Zayed Sports City's International Tennis Center provides weekly free group training sessions for the students within the program, as well as access to the courts during the weekend for both the students and teachers for free play.